Tucked deep within our original entry on Gertrude MacGregor Moffat (1884-1923) was the comment that her youngest sister, Enid (b. 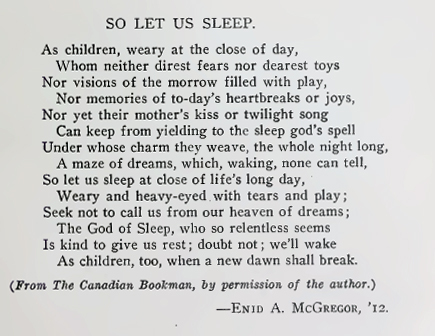 1889), contributed poetry to the Canadian Bookman. We, however, did not have her listed, so that needed fixing. I discovered that she not only submitted poetry to Canadian Bookman, but also poetry and prose to the McMaster University Monthly. I also discovered, searching for a bit more biography in the McMaster publication, that a number of our other authors published there as well. While Enid graduated from McMaster with a BA in 1912, Gertrude attended for only one year (likely around 1901) before ill health forced her to abandon her formal studies. 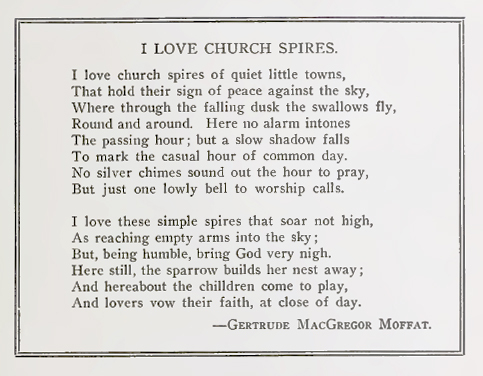 Here are two poems, one by each sister, published in the November 1920 issue of the McMaster University Monthly. McMaster University Monthly 30.2 (November 1920): 53. McMaster University Monthly 30.2 (November 1920): 59.